February 2nd, 2016. 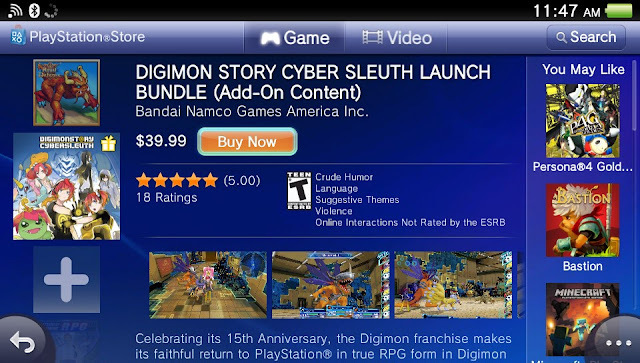 Today Digimon Story Cyber Sleuth went live on the PlayStation Store for North America, available for $39.99 on the PlayStation Vita and $59.99 on the PlayStation 4. For the entire month of February the game is available as a launch bundle, which includes the preorder DLC for Beelzebumon Blast Mode, Cherubimon Vice, and several alternate versions of Agumon and Gabumon. The bundle also comes with several themes, including one featuring the thirteen Royal Knight Digimon, and one with key art by character designer Yasuda Suzuhito. The Vita version of the game a memory card to play due to its size. PS4 copies of the game are also available physically. Cyber Sleuth is the first localized Digimon game in almost eight years. Producer Habu Kazumasa stated that the game is made both for core fans and newcomers, written in such a way that no prior knowledge of Digimon is expected of the player. That knowledge is still rewarded by allusions to past anime series, and an incredible attention to detail put into the in-game Digimon animations, recreating iconic scenes from those anime. In our cover-to-cover review of Cyber Sleuth, we pointed to the game as one candidate for "the best Digimon game ever made," giving it a final score of 9/10. Since even before its Japanese launch, the Digimon fandom campaigned extensively for Cyber Sleuth to receive an international localization, creating the massive Operation Decode petition to see Digimon games brought over to the western world. Everyone fought beautifully for this game's localization. But this fight is not yet over; if OpDecode's original goal--the localization of 3DS game Digimon World Re:Digitize Decode--is to be realized, we will need to move every unit of Cyber Sleuth possible. Digimon Story Cyber Sleuth will launch in Europe on February 5th, 2016.